Wildlife conservation has, sadly, not been immune to the “we only care if it has a cute and cuddly face” groundswell that has swamped the animal protection, and self-proclaimed environmental movements of late: everyone wants to hunt the “dastardly” wild hog that grows its population like rats. But, no one wants to take the “cute and cuddly” black bear or mountain lion in California. In California, there’s even a moratorium on the public hunting of the mountain lion, even though the mountain lion population in California is one of the largest, if not the largest, in the Western United States. This overextended population is eating the truly endangered desert bighorn in Southern California to extinction, and along with poor burning and logging practices, i.e. very infrequently, deer populations in California are also dropping. Because of this, I started singling out the other major California predator that we are legally allowed to hunt on a public tag draw system: even though the misguided, and often mislead, anti-hunting community repeatedly tries to prevent it. My suggestion to newbie hunters is—until California Fish and Game is finally allowed to fully implement well-researched management practices, well-used in other states on deer and mountain lion, free of political grandstanding and meddling—to give deer a break, and instead get a bear tag. “But are bear edible?” is the oft-repeated response. They’re delicious and can easily be prepared using a number of beef, or pig recipes that require low and slow cooking…as most recipes designed to retain moisture, soften muscle tissue and kill diseases that used to be prevalent in even farm pigs, like brucelosis and trichinosis…think braising, stews, dried and fermented sausages, roasts cooked past pink. Average thought is that those who hunt bear only hunt bear for the hide and trophy. For those who actually do hunt bear and use as much of an animal as possible we feel that we get more out of bear than a deer: meat, organs (bear liver makes a phenomenal paté), hide (simply tanned make great rollup pillows for the couch and luxuriously soft linings for baby cribs, as done by Native tribes and pioneers, especially with a thick under layer of fur that comes with the cold of late fall) , claws (great for Native American artwork), tallow (great for rendering to cooking lard–a process definitely not recommended for much more gamey fat from deer), and if you’re knowledgeable in Asian homeopathic medicinal practices, medicine for ailments such as a bruising and arthritis. If you’ve ever had the chance to try a berry pie or pastry made with bear lard instead of Crisco or butter, you’ll remember the nutty flavor of bear lard that makes that pastry the best you’ve ever had! With this mother lode of useable products drawing me to the mountains of the Mendocino National Forest, I arrived the afternoon before Veterans Day and set up camp. The objective was to venture out from camp at the crack of dawn, and work deep down into the canyon formed by the Eel River. Bears, like elk and moose, love water—the more water the better. They drink it. They keep cool in it. And, they wallow in the mud pools along its shore. At least that was the intention before I realized, that I couldn’t get the firewood soaked by the previous day’s rain burning hot, and that the Snugpak sleeping bag I was evaluating on this trip, was a comfort rating off for the freeze that hit that night—disorientated and shivering, I woke every two hours. The next morning, I was so tired, not really wanting to go off the shelf and into the canyon after a bear that was surely going to square at 6-foot-plus and over 300lbs translating to two-day pack out of all that meat by a single hunter. Electing to first drive up to a lookout and check the activity across the river canyon with my binoculars and spotting scope, I loaded my Brittany, excited about his first hunt for bear, in my Ram and drove out of camp. Enthused by the offer, I pulled over and we chatted for only a few minutes before we heard the howls. “Grab your rifle!” Jesse Hruby said. Running, while loading a magazine into my Model 700, I kept Ziggy alongside at heel as we sped for the treed bear. Up in the tree, the bear that had been safe from the hounds below suddenly became anxious. Raising my rifle, I quickly had the crosshairs of my Nightforce NXS on the bear’s chest, just behind its shoulder—the boiler-room we like to call it. When the shot went off, the bear climbed down as if untouched. The bear was only 20 yards away when I shot…I couldn’t have missed! Just as the bear hit the ground running, Ziggy had already broke from my side as if he were fetching a pheasant, and was up there with the hounds, which were trying to bay the bear. An immediate round of shots, one of them another Deep Curl 180 gr. from my .300 Winchester Magnum, and it was down for good. Calling Ziggy back to heel, I was reminded of how much the excitement of hunting with hounds can be like the excitement of combat…sometimes almost as dangerous with all those bullets flying when a bear is on the ground. .308 cal. Speer Deep Curl 180gr. bullets equal tight groups! Could This Be the First Bear Taken With A Speer Deep Curl? While removing the hide from the carcass, and preparing the meat cuts, I noticed a bullet hole in the side that was nearest me during my first shot. I was still smarting from thinking that I had missed the first shot. I’m not that bad of a shot! When I saw the perfectly mushroomed bullet, I immediately realized what had happened. In the excitement of the moment I must have shot through a branch. That the .308 cal., 180 gr. 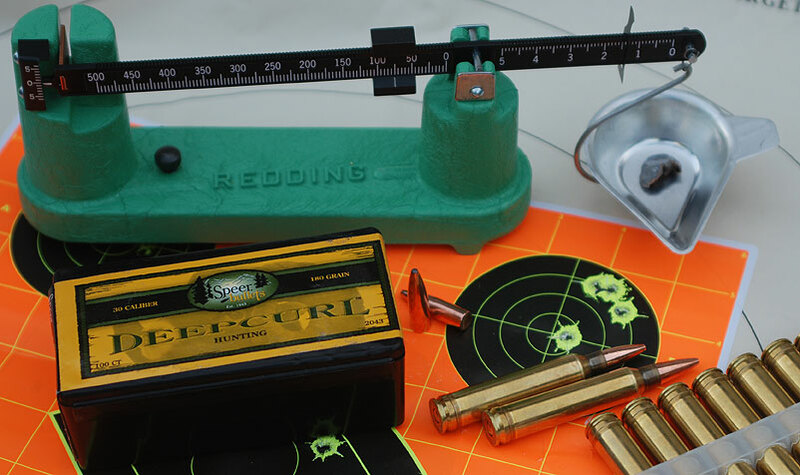 bullet was able to retain 42.4 percent (76.4 gr. ), keeping a perfect shape mushroomed shape (instead of exploding), and penetrate that far was impressive. Because I normally try to get as close as I can to whatever I’m shooting, this was the first bullet I’ve ever found in game I’ve shot. Not that I normally look for them, but most of the game I’ve shot for the table, I’ve shot at an angle that permits modern high-power bullets to pierce both lungs and break through thinner than shoulder joint bones and exit the skin on the other side. This means I don’t lose shoulder meat, which is a lot when you’re as meticulous as I am in using every part as possible of the animal that I kill. Designed as a replacement for the long utilized Speer Hot Cor, the Speer Deep Curl is definitely a bit more. While the original Hot Cor was exactly that—a hot core—hot lead poured into copper tubing, the Deep Curl’s lead core to copper jacket bonding is based on an electrical process. After a quick chat with Tim Brandt, PR Manager at Speer, as the Speer Deep Curl is so new and not in every gun shop, this might be the first black bear taken with the new bullet. From the amount of cohesion and pattern of the mushroom, I’d say this is a definite improvement on the Hot Cor and look forward to using it on feral pigs, deer, caribou and elk in the coming year! Like many hunters who enjoy venturing into the woods for the solitude and intimacy with the natural world that only spot-n-stalk and still-hunting provide, chasing after a pack of Walkers or Black and Tans might seem like having to walk down a block behind a bunch of drunk hooligans. …But, having seen bear, fox, raccoon, and mountain lion hunting hounds in action, I have to tip my hat to them and those who have such a love of their dogs, spending the money and time in the field training and keeping their hounds sharp. Keeping their dogs in tip-top shape and awareness is one of the reasons that I received such a gracious offer from these hound hunters who I’d never even been introduced to until my pulling up in my pickup: fill a bear tag and hunting’s pretty much done. Yes, you can run hounds during many parts of the year, but hunting’s not just coursing. Hunting involves a shot being fired and a dead bear on the ground, which is the whole edifying experience for the hounds…not making the kill would be as dismal for Ziggy if I sent him out for pheasant, then getting the bird he pointed into the air and didn’t shoot, not offering him the full reward and experience circle, of a retrieve. 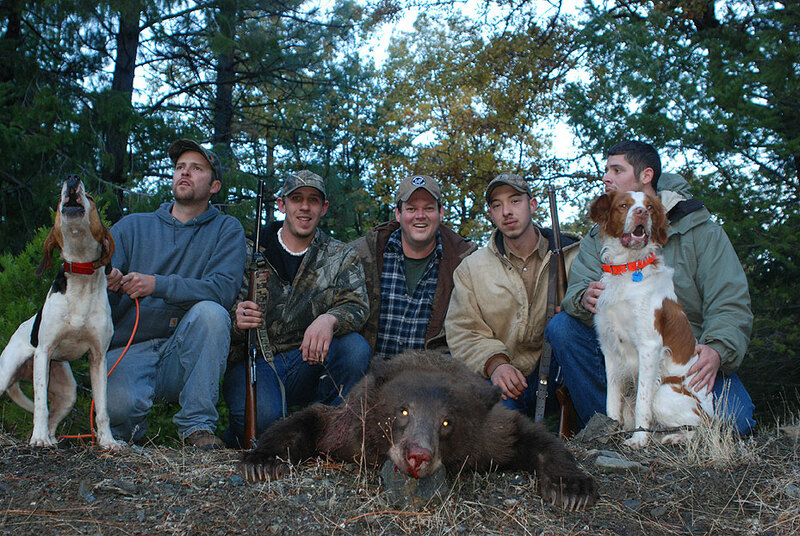 An added benefit of hunting over hounds is that if a hunter decides not to take the animal, the hounds can be leashed and pulled away from the base of the tree and the bear is permitted to run down and escape. Many bear are shot during deer season by deer hunters with an afterthought bear tag—often meaning a bear that is jumped. In that moment of surprise, it’s hard to tell if it’s female, which are illegal in other states, or more importantly, whether there’s an unnoticed accompanying cub or cubs. By using hounds, the hunter has enough time to see if it’s the right bear to take, and adjust appropriately and lessen the chance of orphaned bear cubs. That’s correct, hunting is not sport. It’s an opportunity to get healthy, organic meat protein. It’s a much-needed tool of wildlife conservation….football, basketball and baseball are sports. As a tool of wildlife conservation, hunting with hounds is a very useful tactic: and why game wardens and biologist who deal with depredation, either by bears or mountain lions, even in states where hunting with hounds by the public is not allowed, like Oregon, use them to most efficiently control predator populations; and practice efficient wildlife management for a healthier ecocsystem. Hank Shaw’s Bear Recipe: check out our colleague Hank Shaw’s bear pelmeni recipe here: Hunter Angler Gardener Cook. …In the next month, I’ll be coming up with a recipe by modifying a childhood recipe from my childhood in Southeast Asia that if it works as good as my ours bourguignon recipe, modified from Julia Child’s beef bourguignon, should be just as spectacular! TOPICS: Speer PR Manager Tim Brandt talks about the history of Speer and new line of Deep Curl replacing the lauded Hot Cor bullet.